Camps for gathering volunteers were set up at Hamilton, Helensville, Kawakawa, Dargaville, Whangarei and Matamata. 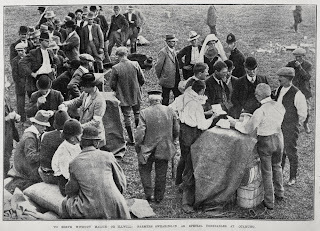 On 5 November the first batch of mounted farmers arrived at a camp set up on the Otahuhu showgrounds, where they were formally enrolled as 'specials'. 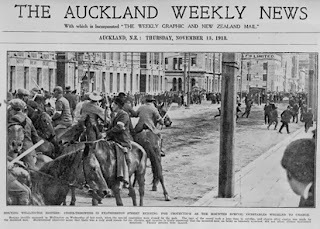 The majority of Auckland's total of 1,902 mounted volunteers came from rural areas of the Northland or the Waikato, but there were also significant numbers from South Auckland localities. 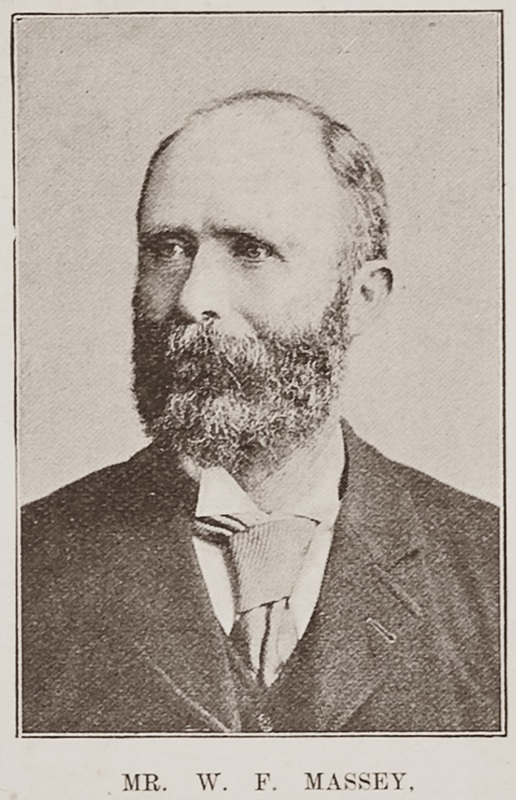 According to figures published in the semi-official volunteer-produced 'Camp Gazette', Waiuku with a total of 53 volunteers led the South Auckland contribution by far. Then came Buckland (23), Clevedon (17), East Tamaki (15), Patumahoe (15), Pukekohe (14), Tuakau (10), Mauku (9), Manurewa (8) and Bombay (4). There were three volunteers each from Glenbrook and Otahuhu; two from Aka Aka, Papatoetoe, Paparimu, Puni and Runciman; one each from Karaka, Pokeno and Waiau Pa. The special constables in the photo above included: Kennedy Ross (far left in the back row); Jim Ross (third from left) and Lou Gillard (far right). The 'Camp Gazette' for 27 November 1913 reported: "East Tamaki Troop of B. Squadron 2nd Regiment, under the popular Captain Scholefield, have erected a very neat flag of blue and white, being the Auckland representative colours. Congratulations to the men of Tamaki!”. 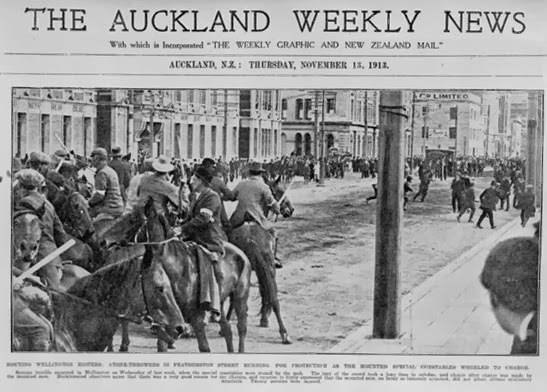 Most of the mounted men transferred to the Domain on or after 6 November, although smaller camps were also established in Remuera and near the wharves. 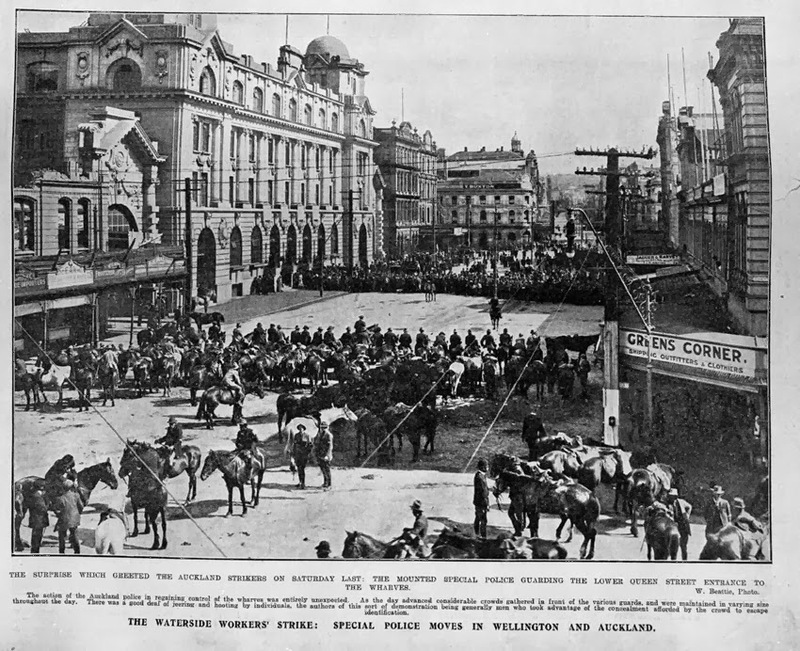 The 'specials' took control of the wharves on 8 November, at which stage the strike in Auckland become more-or-less general. This phase lasted little more than a week, however, after which strikers gradually returned to work. The strike was formally called off on 24 November, although some unions held out longer - the waterside workers until 19 December. The specials by that time had mostly quietly returned home. "The police enlisted thousands of special constables with horses and batons and sometimes revolvers [sic]. Young farmers, 'Massey's Cossacks', rode into the main ports as 'specials' to intimidate the strikers and the public ..." ('Poverty and Progress in New Zealand' (1969, p.65). Popular mythology thus has it that the 'specials' were armed thugs rampaging out-of-control through the streets. This view reaches its apogee in Chris Trotter's book, 'No Left Turn' (2007, p.90), which characterises them as a proto- or Ur-Fascist species ("Look at the carefully posed photographs of these lads: young, confident, flaxen-haired, resplendent in their brown shirts and riding boots, batons in hands, it really is hard to tell whether they're from Hamilton or Hamburg ..."). 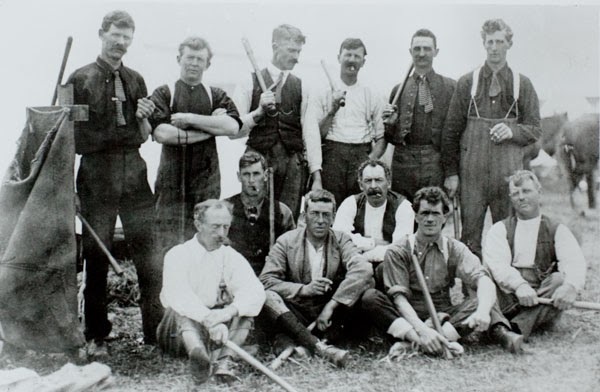 Certainly the specials were issued - and often photographed, as seen above - with fearsome looking batons (the official issue was long hardwood batons, or sometimes axe handles, for mounted specials; short batons for foot specials). However, contemporary reports make it clear that intimidation - abuse, stones, bricks and perhaps even gunshot - was equally directed by the strikers against the strike-breakers. 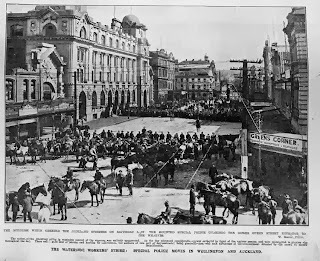 Most of the violence occurred in Wellington, where the strike began, rhetoric was at its hottest, and for a time the strikers seized control of the wharves. There ensued scenes never seen before on New Zealand streets. Soldiers and sailors paraded with fixed bayonets. Machine gun emplacements were set up on street corners. Spiked devices to lame horses were strewn on the streets. Even a cache of dynamite was discovered. In the overheated atmosphere a number of bloody clashes occurred between the police and special constables and the strikers and their supporters. Auckland was in general a much quieter place, although there were some ugly scenes when the specials occupied the wharves. Some sources suggest that a number of the Auckland specials who occupied the wharves were armed with revolvers. There is no contemporary or independent evidence of this. On 9 November 1913 one special, Ted Bilkley, of Buckland, was wounded in the arm by what seemed to be a revolver shot from out of the crowd, but he suffered little harm, since the weapon - if it existed - was either primed with a low-grade charge or armed with a stone rather than a bullet. However grim the situation may have seemed at the time, as far as South Auckland's specials were concerned, the bitterness did not persist. In August 1914 the Mauku branch of the Farmers' Union took up a collection to help the wives and children of former strikers who were suffering hardship. Bruce Farland, 'Farmer Bill: William Ferguson Massey and the Reform Party ' (2008). We are building a full resource from across various institutions here: http://www.flickr.com/photos/1913strike/. May of your images are uploaded here (and referenced as required by your copyright statement). This is great, many thanks for letting us know about these projects and sending through the links. Wonderful to see use of the Sir George Grey Special Collections images - the Flickr page is a wonderful resource. We have a Unionist in Waikumete Cemetery who was part of that strike and was also in the other strikes that NZ had. His name is Albert Boonstra. He is buried in Anglican A. I have yet to do a talk on him. Hi John. I was wondering if you were speaking of Alfred Boonstra? He is a relation of mine and I am trying to find out more info on him.